Back in February, indie band Crying Nut filed a copyright infringement lawsuit against pop rock band CNBLUE and its agency, FNC Entertainment, for using one of its songs on a TV show and DVD without permission. Now, FNC Entertainment has asked a Korean court to order indie band Crying Nut to delete posts on the latter's website pertaining to the lawsuit. The injunction was filed by FNC Entertainment before the Seoul Central District Court. “The lawsuit is still going on and the results have yet to come, but [Crying Nut] is posting through its official site that CN Blue has robbed it of intellectual property rights. We’re asking that they stop talking about their side of the story so openly and as if it was the truth," said FNC Entertainment, according to ENewsWorld. In June 2010, CNBLUE performed Crying Nut's "Deadly Offside" on music show Mnet "M! Countdown." The TV performance was also included in a DVD released in Japan. 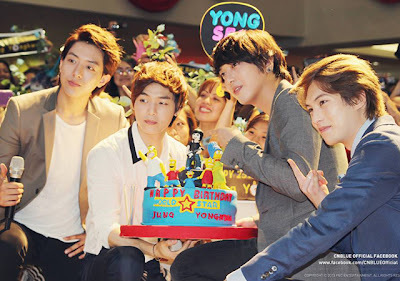 The indie band filed a 40 million won (P1.5 million) lawsuit against CNBLUE and FNC Entertainment. FNC has maintained its innocence on the issue, saying it was music show "M! Countdown" which made the request for CNBLUE to perform the song. Mnet paid Crying Nut last year for using the song and apologized to CNBLUE and the indie band. FNC also expressed its regret over the issue. "We would like to express our utmost regret on the recent happenings involving CNBLUE. We admit without excuses that it was the agency’s fault for sending our artists to the stage without fully checking the audio files due to the urgency of a live broadcast," said FNC, according to ENewsWorld. "We would like to sincerely apologize on behalf of the members to the Crying Nut party, who has been troubled through the series of recent events. We deeply sympathize with problems that arose in this situation and promise to make sure this will not happen again in the future. However, concerning the DVD, as several new media and the broadcast station have been saying, we would like to once again state that the company did not participate in the commercial production," the agency said. CNBLUE visited the Philippines last month and held their "Blue Moon: 2013 CNBLUE World Tour" at Araneta Coliseum.